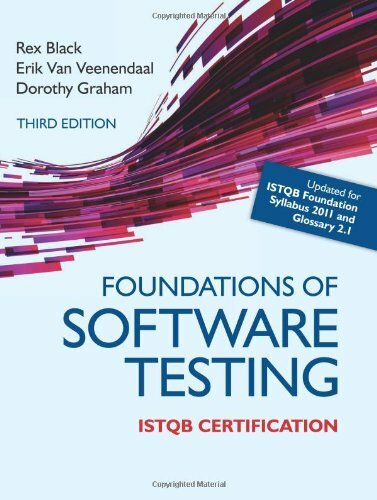 Now in its third edition, Foundations of Software Testing: ISTQB Certification is the essential guide to software testing and to the ISTQB Foundation qualification. Completely updated to comprehensively reflect the most recent changes to the ISTQB Foundation Syllabus, the book adopts a practical, hands-on approach, covering the fundamental topics that every system and software tester should know. The authors are themselves developers of the ISTQB syllabus and are highly respected international authorities, teachers and authors within the field of software testing. Software Testing: ISTQB Certification, and Test Maturity Model Integration TMMi. Erik is a former senior lecturer at the Eindhoven University of Technology, was vice-president of the International Software Testing Qualifications Board (2005-2009), and is currently a board member of the TMMi Foundation. You can follow Erik on twitter @ErikvVeenendaal.